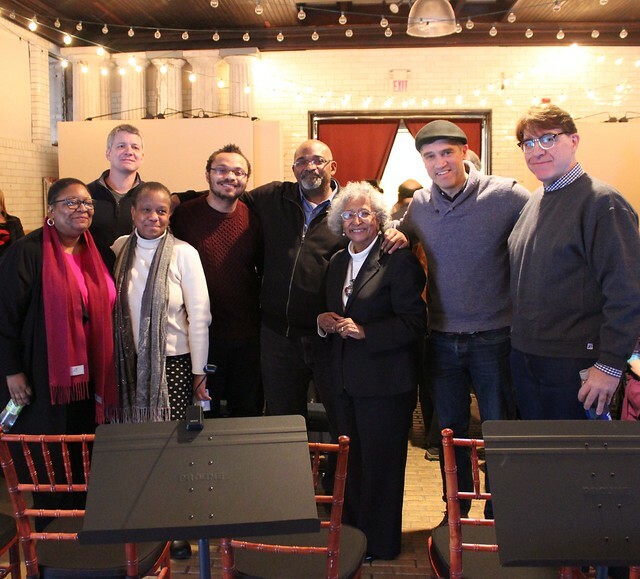 Members of the cast and director Jeremy Davidson with founders of Rye's Friends of the historic Rye African-American Cemetery. L - R Myra Lucretia Taylor, Chris Henry Coffey, Joan Grangenois-Thomas, Kyle Thomas, David Thomas, Doris Bailey Reavis, Jeremy D | Flickr - Photo Sharing! For one weekend, the 1907 Van Norden Carriage House was transformed into a complete stage set with lights, sound and projection for two performances of “The Kept Private.” This powerful story, based on 19th century transcripts, illuminated the tortuous pension application of a 93 year old African American veteran of the Revolutionary War. Set in Dutchess County, present day dialogues between the historians, geologists, living relatives and ordinary people who helped uncover the tale were woven together with the authentic testimony of a black farmer named Andrew Frazier. Before a local Quaker judge, Private Frazier was pressed to produce proof and witnesses to his 3 years of service in the NY troops, which included marching in the Battles of Harlem and White Plains. Audience members leaned forward in their chairs eager to find out if there was a resolution to Frazier's tenacious appeal; the one hour script led them there and beyond his last breath to a search for his burial site led by his descendants and a revelation about Andrew’s great-granddaughter, who in 1896 became the first person of color to teach white children in New York City public schools. Attendees called the production “riveting.” Conversations between the actors and the audience afterwards were lively and passionate. A stellar 10 actor cast was directed by Jeremy Davidson of Storyhorse Documentary Theater and included Frankie Faison, Jennifer Mudge, Chris Henry Coffey, John Bedford Lloyd, J. Alphonse Nicholson, EJ Carroll, Howard Overshown, Myra Lucretia Taylor, Stephen M. Jones, and John Thomas Waite. Numerous historians, members of African American non-profits, DAR members, stewards of landmark sites and cemeteries came great distances from other municipalities to see this unique production. There were important takeaways about the continued need for open dialogue about race and persistence in preserving our shared American heritage and history. The presentation was dedicated to the memory of Robert S. Brown, a Rye native and youth advocate who promoted the teaching of black culture in schools and vigorously defended civil rights in Westchester. Joan Grangenois-Thomas spoke a few words at the beginning of Sunday's matinee on behalf of Tom Kissner, President of the Port Chester/Rye NAACP about Bob's many accomplishments in the face of discrimination and racism.